One taste of our Classic Sharp Cheddar and you'll understand why it's won more awards than any other cheddar. It's come home with a bushel of prizes including Blue Ribbon Best of Class from the U.S. Championship Cheese Contest and Outstanding Classic at the International Fancy Food Show. 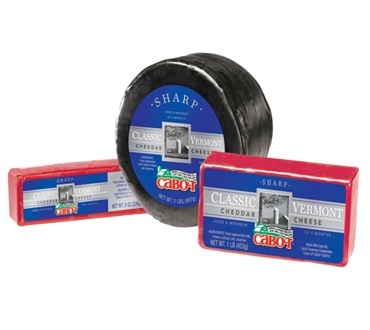 Its rich, signature cheddar flavor and silken texture come from up to 8 months of natural aging. Great in everything from hors doeuvres to souffles, this versatile classic is one delicious world-class cheddar. 2. Place eight of graham cracker squares on baking sheet; top each with segment of chocolate followed by piece of cheese. Top with remaining graham cracker squares. 3. Bake for about 4 minutes or just until cheese and chocolate start to melt. 4. Remove from oven and press down gently on each S'more. Serve warm, or let cool to serve later at room temperature. I am a " cheesy " person. It's my favorite snack. I love the creamy texture of this cheese, great for mac and cheese. I keep reordering, because I don't want to run out. It is sharp, but not to sharp. I really like it comes in vaxted blocks, so it is better preserved and last longer. Just had 3 more blocks delivered. Highly recommend!!!! Love the fact it is waxed to better preserve the cheese. Best cheese for snacks, omelets, grilled cheese sandwiches.